Conjecture over how thujone affects the central nervous system has been going on for years. It has been known as a convulsant and was also thought to be hallucinogenic, but how it acted wasn't understood. Only recently have scientists found solid evidence for its actions. Thujone is a GABA-a receptor antagonist, which means it inhibits GABA receptor activation. GABA, Gamma-AminoButyric Acid, is a neurotransmitter that acts to inhibit synapses, in effect regulating their speed by adjusting how easy it is for a neuron to fire. Many drugs such as ethanol and diazepam (Valium) are GABA agonists and produce relaxation partly by increasing GABA neurotransmitter which increases the ease at which the GABA receptors can slow down neuron firing. Thujone is the opposite of these drugs, by inhibiting GABA receptors thujone decreases GABA's slow down effect and allows neurons to fire more easily. Since a-thujone has been found to be more active than b-thujone, most studies on toxicity focus on it. 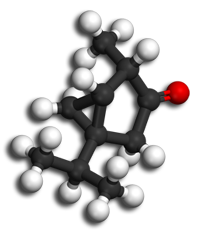 In 2000 a toxicological study of a-thujone was done on mice by Hold, et al. It was found that mice have an LD50 (dose at which 50% of the test subjects die) of around 45 mg/kg-thujone (45 mg a-thujone per kilogram body weight), with an LD0 dose at 30 mg/kg and LD100 dose at 60 mg/kg. When given a dose between 30 mg/kg and 45 mg/kg the mice would exhibit muscle spasms that led to general convulsions until they recovered or died. Mice exposed to higher doses had general convulsions that led to death within one minute. One interesting find of this study was a pretreatment of diazepam or 1 g/kg of ethanol protected the mice from a 100 mg/kg dose of a-thujone, almost double an LD100 dose. It was also found that a-thujone is quickly metabolized in the liver and doesn't persist in the mouse's system. This matches quite well with the activities of other GABA antagonists. However it doesn't fit with anecdotal claims of hallucinations and there is no evidence that any amount of thujone will cause hallucinations. An LD50 dose in humans is not known, as it is generally looked down upon to test lethal doses on humans. However for a 150 pound (68kg) person to reach a dose one hundred times lower than the LD50 dose in mice they would need to quickly ingest 30.6mg of thujone or 874ml of 35 mg/l absinthe. Even at only 45% ABV they would die of alcohol poisoning long before reaching this dose and that doesn't take into account that only part of that 35 mg/l will bea-thujone. A paper in the Journal of Studies on Alcohol recorded the effects of 0.28 mg/kg thujone in alcohol, 0.028 mg/kg in alcohol and just plain alcohol on 25 subjects. To put those numbers in perspective, for a 68kg person that's 544ml of 35 mg/l absinthe, 54.4ml 35 mg/l absinthe and of course plain alcohol. The subjects were then given performance tests, the higher dose "had a negative effect on attention performance," the low dose and no dose showed no differences. Only three subjects could tell the difference between doses. For thujone in absinthe to have a noticeable effect on someone it would need to exist in very high levels. Lemercier "Abisinthe" is labeled as an "Amer", that is, bitters. Today the EU regulates thujone amounts to 10 mg/l in high proof beverages and 35 mg/l in beverages labeled as "bitters." It has been previously thought that pre-ban absinthe drunk at the turn of the 20th century had much higher levels than this, but current scientific evidence shows that might not be the case. A 2004 study by Emmert et al tested fourteen modern brands. Most fell in a similar range, six contained 10 mg/l or less, three over 10 mg/l but under the 35 mg/l bitters limit and finally five contained no thujone at all. It is possible to create an absinthe with higher thujone by either selecting high-thujone plants, adjusting distillation methods or adding wormwood herb or oil after distillation. Even then it takes effort to come up with an absinthe that falls outside EU regulations. As there is no evidence historical producers tried to maximize thujone content or could evenly accurately test for it, it's safe to say efforts to increase it are not traditional and modern absinthe is equal to if not higher in thujone content than vintage. Some companies use thujone to market their product by using claims such as "maximum thujone" or by boldly marking the label with its thujone contents. This used to be considered important but it's now known that it's not much more than marketing hype. The number given is questionable, not only can it vary drastically from different plant sources but without an expensive GC-MS test it can't be known for sure if it's accurate at all. Some âhigh-thujoneâ absinthes may in fact contain little to no thujone. This would be noteworthy assuming the actual level is important, which it isn't. WN Arnold estimated, in a 1992 report, a thujone content of 260-350 mg/l in absinthe. This was based on an estimation of the thujone content in wormwood, the amount of wormwood used in absinthe, and the assumption that all of the thujone ends up in the final product. Even though no actual tests were done these numbers are still cited in papers today as an accurate value. It's still often claimed in marketing these high-thujone products that they are closer to traditional, old absinthes and that other, truly traditional modern absinthe has been toned down from the original, but we now know that isn't true either. The belief that thujone is important is long-standing and wide-spread, it may be a long time before companies stop playing on its myths and cease marketing aimed at those who see absinthe and thujone as drugs. Thujone's journey to fame began many years ago in 1845 when it was first isolated from wormwood oil but it wasn't specifically blamed until later. That credit went to wormwood first, in 1864, when Dr. Valentin Magnan began studying alcohol and wormwood oil. Magnan experimented by locking a guinea pig up in a glass case with a saucer of alcohol and another in a similar case with a saucer of wormwood oil. The guinea pig with the alcohol just became drunk whereas the one exposed to wormwood oil vapors fell into convulsions. This convinced Magnan that absinthe was more dangerous than plain alcohol but many were skeptical. Magnan continued his experiments and in 1872 reduced skepticism when he announced he had discovered a product in wormwood (thujone) which when given to a large dog caused it to have a violent epileptic attack and die. He then gave another dog a lethal dose of ethanol, noting the distinct differences in symptoms the two caused. This silenced some of the skeptics and two years later Magnan studied 250 cases of alcoholism concluding those that drank absinthe suffered worse effects such as convulsions and delusions. It was enough to convince many scientists, especially prohibitionists. These conclusions were most likely based on a poor understanding of diseases and his preoccupation that alcohol and absinthe were the prime causes of the "degeneration" of France. Many illnesses, poisonings and mental disorders were probably clumped into absinthism. After absinthe was banned, research died down. As time went on the old studies were assumed to be accurate. It wasn't until the 1960's cultural revolution that absinthe and thujone began to be looked at again, not in spite of its reputation but because of it. A book of Legal Highs was published by Adam Gottlieb in 1973 listing wormwood along with the claim that its oil could be added to Pernod pastis to make absinthe. Renewed scientific interest in recreational chemicals prompted a 1975 Nature Magazine article on thujone. By comparing the molecular structure of thujone to THC (one active ingredient in marijuana) it concluded that thujone acted similarly to THC and bound to the same receptors, however no actual tests were performed. Today we know this is inaccurate, but in spite of that the claim that thujone is similar in action to THC can still be found on drug enthusiastsâ and faux absinthe marketing web sites. Only recently have the old studies been questioned. Since 2000 the evidence has been quickly mounting that thujone plays little to no role in the most likely non-existent disease of absinthism. Unfortunately the myth still persists. Many companies market to those looking for high thujone content and even the FDA still believes them. In a January 2006 article a spokesman for the FDA had this to say about thujone, "Absinthe is banned in the United States because of harmful neurological effects caused by a toxic chemical called thujone," The myth has had 142 years to spread, let's hope it doesn't take that long to do away with. 3. Sites of alcohol and volatile anaesthetic action on GABA(A) and glycine receptors. Mihic SJ et al. 6. Determination of a-/b-Thujone and Related Terpenes in Absinthe using Solid Phase Extraction and Gas Chromatography, Emmert et al. 7. ThujoneâCause of absinthism? Lachenmeier, Emmert et al. 13. Absinthism: a fictitious 19th century syndrome with present impact , Padosch et al.